It has been over a year now since "The Great Recession" officially began, and yet even a basic understanding of the real causes of America's economic problems has still not emerged in the public. Indeed new movements have emerged touting as solutions to our current economic problems many of the very policy ideas that are actually the causes of our current economic problems. The rallying cry of conservatives across America has been a "return to the policies of Reagan!" The claim of many American conservatives has been that Ronald Reagan faced similar economic conditions when he was elected, and he was able to turn the economy around, so we need to return to the principles he used to reinvigorate the American economy. The reality is that the economic policies of the "Reagan Revolution" have been in effect for the past three decades, and it is these very policies that have caused the economic situation that America finds itself in today. During his first presidential campaign Ronald Reagan campaigned against government spending, he campaigned on reducing the national debt, he campaigned for individual responsibility, and he campaigned for broader American capital ownership. The effects of his policies, however, had all of the exact opposite effects, and yet amazingly even today the vast majority of all Americans, especially conservatives, still believe Reagan's rhetoric and not the real effects of his policies. We can leave our children with an unrepayable massive debt and a shattered economy, or we can leave them liberty in a land where every individual has the opportunity to be whatever God intended us to be. All it takes is a little common sense and recognition of our own ability. Together we can forge a new beginning for America." The irony of this speech is that the national debt was not out of control at all in 1981, in fact the national debt was at the lowest point it has ever been since World War II in 1980. In the speech Reagan cited national debt figures in raw dollar amounts, unadjusted for inflation and not tied to GDP. Those figures are essentially worthless and no economist would ever use them as a measure of the national debt. But presenting the national debt as a problem was a means of justifying significant cuts in domestic spending, which he framed as "redistribution". Reagan then went on to claim that by reducing income tax rates it would increase the growth in income tax revenues, and that the principle of reduced rates leading to increasing revenue would lead to a cycle of income tax reductions resulting in ever growing income tax collections. In fact federal tax collections under Reagan grew at the lowest pace of any post WWII president and his successor George Bush was forced to raise taxes in order to avert a total budget calamity. The final irony of this speech is that today is indeed our judgment day on the negative economic forces that Reagan himself unleashed. Reagan warned against leaving our children with an "unrepayable" massive debt and a shattered economy, yet at the time that Reagan took office the United States was a nation of savers and the government had barely any debt at all. The policies instituted by Reagan led to a massive ballooning of the national debt and turned a nation of savers into a nation of debtors. While the conditions that Reagan warned against did not even exist when he took office, Reagan himself set the forces in motion that would bring about the very conditions that he so direly warned against. 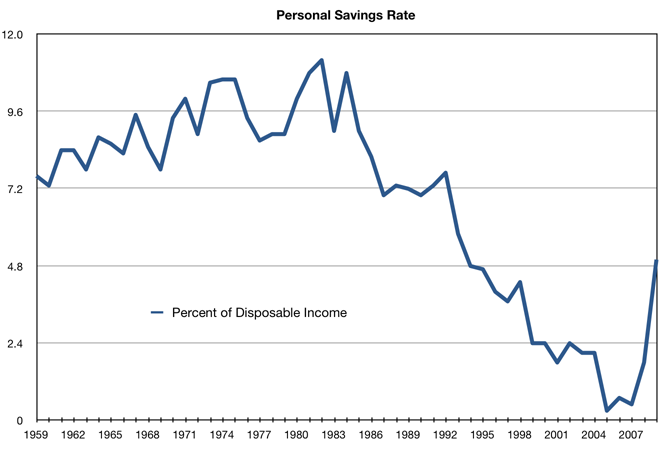 Not only did Reagan's policies lead to massive increases in the federal debt, but household debt grew as well while personal savings declined. Of course there were real economic problems in America when Reagan took office. When Reagan took office the unemployment rate was around 8% and it peaked at 10.8% about two years into his presidency. Inflation was high in the late 1970s as were interest rates. Indeed the high interest rates were a significant factor in the high savings rates and low debt levels. The economic problems, however, were largely driven by two factors: the Federal Reserve's monetary policy and the energy crises of 1973 and 1979, which were products of political hostility toward the United States for American support of Israel and later due to the Iranian Revolution. The energy crises led to high energy costs and fuel shortages across the country. So the major problems that the American economy faced were high inflation, caused in large part by the rising energy prices, and high interest rates, which were pushed higher by the Federal Reserve in order to try and control inflation. 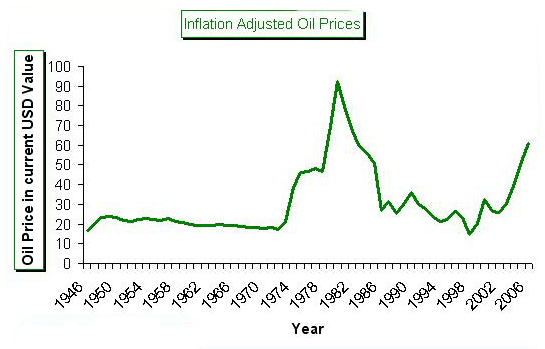 When energy prices began to come down in the early 1980s due to decreases in demand from lower usage and the adoption more efficient products as well as massive increases in oil production by non-OPEC and non-Middle Eastern countries, such as Mexico, Venezuela, Norway, etc. this reduced inflation and allowed the Fed to reduce interest rates. Those two things, the resolution of the energy crises and the lowering of interest rates, were really the most important factors in the economic recovery of the 1980s. But, of course, that is not all that was done. The economic crisis of the late 1970s served as a springboard to enact sweeping changes to the American economy. Some of these changes, such as deregulation, were set in motion by Democrats prior to the election of Ronald Reagan, while others, such as tax reforms, were most pronounced under the Reagan administration. The most obvious changes enacted during the Reagan presidency were the dramatic reductions in marginal tax rates. Reagan pushed for, and got from the Democratic congress, significant reductions in capital gains taxes and the marginal rates on payroll taxes. At the same time, Reagan pushed for, and got, significant increases in Social Security and Medicare taxes, as well as a number of other low end taxes. This was advocated by Reagan as a means of broadening the tax base. Tax reform under Reagan was achieved through a successive series of bills from 1981 to 1987, which saw the top federal income tax bracket go from 70% in 1980 down to 28%, while taxes on the bottom 80% of the country effectively stayed the same or increased slightly. 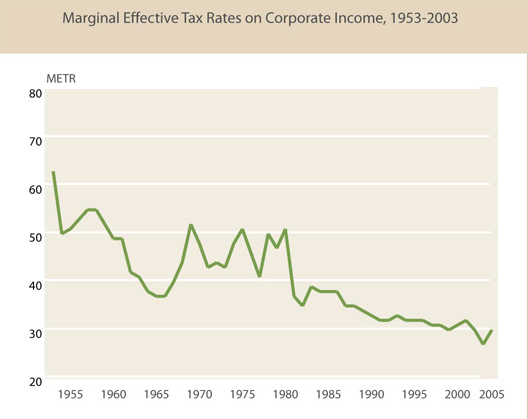 While the marginal federal income tax rate was 70% in 1980, there were a number of loop holes in the tax code, allowing top income recipients to pay significantly lower than 70% tax on their marginal income, however, the tax reforms of the Reagan administration still resulted in significantly lower tax obligations on the high incomes. In addition to reductions on marginal income tax rates, capital gains taxes were reduced from an effective maximum rate of 49.875% down to 20%. The minimum 15% tax rate on capital gains was also eliminated under Reagan. The tax rates were not just changed, but the entire tax code surrounding capital gains was changed, shortening the period of time capital had to be held in order to qualify for lower long-term gains tax rates in addition to a number of provisions on the holding and realizing of capital gains. Corporate income taxes were also reduced under Reagan, to their lowest levels since World War II at that time (they are now even lower). Pressure for many of the changes that the Reagan era ushered in had been building for decades. Indeed Barry Goldwater's campaign for President in 1964 (which highly influenced Reagan) can be seen as the political emergence of the national movement against FDR's New Deal economy. Reagan made his name early on politically by campaigning against government programs and corporate regulation in the 1950s and early 1960s. When legislation for Medicare was introduced in the early 1960s Reagan toured the country giving speeches against it and recorded a speech for the American Medical Association proclaiming that if Medicare is passed, "we will awake to find that we have socialism. And if you don't do this, and if I don't do it, one of these days, you and I are going to spend our sunset years telling our children, and our children's children, what it once was like in America when men were free." Other changes were also already underway in the private sector as well. The way banks were operating was already changing during the 1960s and 1970s, despite a lack of legislative changes, as many processes were becoming more automated, efficient, and less expensive, leading to changes in the scale and scope of banking and investment activity. Corporations in general were getting larger and the percentage of people working for large corporations was going up. Demands put on the financial sector grew as the size of corporations and institutional investors grew. Likewise, changes in the consumer marketplace were already underway by the time Reagan was elected as well. The rise of large "big-box" discount department stores began in the 1960s with companies like Wal-Mart, and this market trend just happened to hit critical mass in the 1980s. But while fundamental changes in the American economy were already underway before Reagan ever stepped into office, Reagan further strengthened corporate interests and helped clear the way for dramatic increases in the consolidation of capital ownership. Other changes by Reagan and later conservatives also greatly increased the power and influence of industry groups and lobbyists in government as well. Furthermore, Reagan had perhaps the most significant impact on public attitudes toward government and private industry of any president since Franklin D. Roosevelt. While FDR played a major role in shaping the public perception of government as an effective champion of the people against tyrannical moneyed interests, Reagan successfully portrayed government as a tyrannical force against the moneyed interests of the people. When Reagan famously said that, "government is not the solution to our problem; government is the problem," in his First Inaugural Address in 1981, he set the political tone for decades, a tone that persists to this day. Reagan effectively framed government as an enemy of the people and the wealthy as the saviors of the people, to whom the public was indebted. There was certainly an undercurrent of racism in the white middle-class anxiety that Reagan tapped into. There was a perception among middle-class whites, especially in the South, that the federal government was benefiting blacks more than whites, that it was effectively taking money from whites and redistributing it to blacks. During his presidential campaign Reagan told the story of a woman from Chicago, whom he called a "Welfare Queen". He claimed that she had multiple aliases and was collecting over $150,000 a year from the government. It turns out that no such woman ever existed. Reagan did not specifically say that the woman was black, but he described her in ways that fit existing black stereotypes, for example claiming that she was from South Chicago (a predominately black neighborhood) and drove a Cadillac. Reagan regularly portrayed the recipients of welfare and food stamp programs as blacks and portrayed welfare programs as a drain on the average tax payer's wallet. He identified public assistance programs as one of the sources of the middle-class's economic problems, claiming that the middle-class was effectively being bled dry by the poor. This narrative connected with the white-middle class in part because there had in fact been dramatic improvements in the African-American economic condition during the 1960s in large part due to federal policies, though in reality it had more to do with improvements in education for African-Americans, Civil Rights legislation, and ending overtly discriminatory policies towards African-Americans. Even though blacks were still far behind whites economically in America, the economic status of blacks did improve more rapidly than whites during the 1960s, largely because they were so far behind to start with. The reality is that federal government policies were helping blacks. The integration of public schools, affirmative action, the federal fair housing law, etc. all worked to improve the situation of blacks in America, by combating unfair practices used against blacks. But improvements in African-American economic conditions were portrayed by conservatives as a zero sum game, in which black gains came at a cost to whites, and this played a significant role in convincing many middle-class whites that it was the poor who were holding them back and that the federal government was the agent of this attack on the white middle-class. The reality, however, is that government policy played a major role in the creation of the white middle-class in the first place. A number of financial and labor reforms that were put in place by FDR during the 1930s played a major role in the building of the American middle-class. The implementation of the minimum wage, the federal backing of labor unions, federal housing loan programs, the G.I. Bill and other forms of financial support for going to college, the expansion of the public school curriculum with a focus on science and math, the subsidizing of cheap food, and the overall stabilizing of the financial system all helped to build the American middle-class. Whites also disproportionately benefited from many of these policies as well, such as the G.I. Bill, and housing loan programs. In addition, the rapid expansion of the nation's infrastructure by the federal government from the 1930s through the 1960s also had a dramatic impact on the economic development of the country. Again this impact was greatest for whites, as areas of white population received a far disproportionate level of development. Indeed white rural America was the most disproportionate beneficiary of the infrastructural building boom of the 1930s-1960s, with programs like FDR's Rural Electrification Program, the Tennessee Valley Authority, and road development programs transforming thousands of isolated areas from areas with no electricity, no running water, and and no paved roads in 1930 into places with electricity, running water, paved roads, and telephones by 1940. The interstate highway system commissioned by Dwight Eisenhower in 1956 literally paved the way, along with prior government initiatives, for the rapid development of the middle-class American suburbs. What is most striking about the household income growth shown above (which shows median income) is that the number of workers per household has been steadily increasing over the past several decades. Indeed what little growth there has been in median household income from the 1980s to present has been a product of the increasing number of workers per household, not of increasing individual compensation, while growth in median household income from the 1940s through the 1960s was predominately a product of increasing individual compensation. The fact is that the American middle-class was built from the 1940s through the 1970s, and it has been in decline ever since. America as we know it is a product of that period. Prior to the Civil War America had an agricultural economy, in which wealth was relatively evenly distributed compared to Europe, almost entirely due to the fact that the primary form of wealth and capital was land, which was easily available, with many ways to acquire it for free or at a nominal price from the government. Industrialization began after the Civil War, and with industrialization income inequality rapidly increased, except for a brief period shortly prior to and during World War I (due to the growing labor movement and rising labor prices). After World War I (and the Russian Revolution) the labor movement was reversed in America, with laws against unionization, and labor prices began falling again. During this time income inequality increased rapidly until the administration of FDR. The period from the end of World War II through the 1970s was unique in American history in that it was the only time in America's industrialized history in which there was prolonged egalitarian economic growth, in which incomes rose at almost equal rates among all income classes. Indeed the poor saw the largest gains during this time while the wealthy saw the lowest. It is this period that built the broad middle-class that defined modern American society and laid the foundation for the future American economy. It was during this time that the American middle-class was larger than it had ever been, and has ever been since as a percentage of the population. 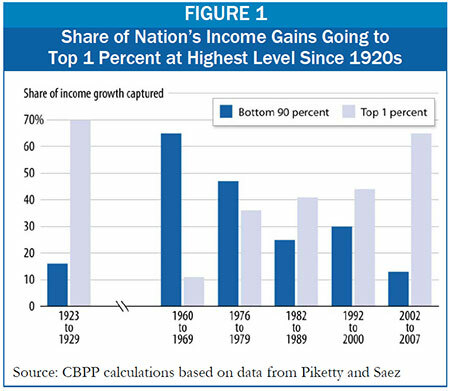 As we can see in the graph above, contrary to the popular claim that Reagan's economic agenda would be a "rising tide" that would "lift all boats", the real rising tide that lifted all boats was the period prior to Reagan, whereas the post-Reagan era has seen gains skewed strongly toward the wealthy. Because this graph shows household income, not individual income, the modest increases in the 1st through 4th income brackets are also largely a product of an increasing number of workers per household, not actual individual gains. 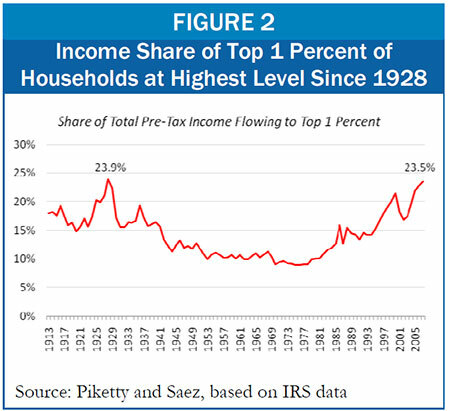 As shown in the data below, the period after World War II and prior to Reagan was a period when the share of national income going to the broad base of the population grew the most, while since Reagan income gains have gone primarily to the top1%. Figure 3 below shows that not only was income growth much stronger for the bottom 90% of the people in the period between World War II and Reagan, but total income growth for the entire nation was also stronger during this period. So we can see that the period of most equal income distribution in modern American history was the period between the end of World War II and the entrance of Ronald Reagan into office. We can see that the period from the end of World War II to the end of the 1970s was a period in which the majority of the economic gains went to the majority of the people and that in the Reagan and post-Reagan eras the majority of the economic gains went to the wealthiest 1% of the population. That economic disparity in America has grown dramatically since the "Reagan Revolution" is undisputed, but the question now is, why and how has it grown? The period since World War II has seen a relatively consistent upward trend in Gross Domestic Product, or economic output. GDP growth in the Reagan and post-Reagan eras is comparable to that from World War II up until Reagan took office. 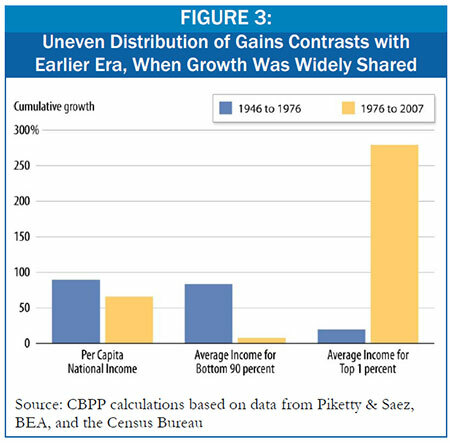 Trends in economic growth have gone unchanged since World War II, so what accounts for the radical change in the distribution of compensation that is marked by the Reagan and post-Reagan eras? The graph above is key to understanding the growing income inequality in America. From the end of World War II through the end of the 1970s the gains from increases in productivity were broadly shared among all segments of the work force. Beginning in the late 1970s, however, and continuing on after that, worker compensation leveled off and the additional gains produced by increasing productivity went almost entirely to executives and owners/shareholders. There are a few different ways to explain this. One is to say that the economy, driven by market forces, is accurately reflecting the relative contributions of the different actors in the economy, and that its simply the case that over the past 30 years all of the growth in productivity is a product of capital and contributions from management, that essentially 90% of the work force has made no contributions to the growth in American productivity over the past 30 years. That's one possible explanation. A second explanation is that the compensation going to workers prior to 1980 was too high, i.e. that 90% of the work force was over paid during the period between World War II and the 1980s, and that what we've seen over the past 30 years has been a market correction, brought about by the fair and just reforms of the Reagan and post-Reagan eras. And yet a third possible explanation is that executives and capital owners have unfairly been the recipients of all of the economic gains of the past 30 years, at the expense of the majority of American workers who helped to produce those gains. 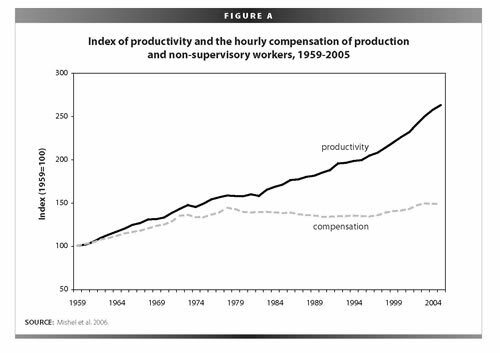 Productivity gains produced in part by workers have been realized by executives and capital owners instead of by the workers responsible for the gains. The first thing to understand is that worker productivity has steadily risen in America since World War II, and has risen at roughly the same rate since 1980 as it did between 1940 and 1970. If anything worker productivity has actually risen faster over the past 30 years than it did during the 1960s and 70s. What our economy is telling us by the way that income has been allocated, is that the rise in worker productivity over the past 30 years has been solely a product of capital and management, i.e. that managers and machines have effectively produced 100% of the productivity gains of the past 30 years. The only way that the income distributions of the past 30 year can be called "fair" and appropriate is if that statement is true, but is that statement true? Well, the most obvious measure of the changing workforce is education. One intuitively expects that a more highly educated work force would be a more productive workforce. By this measure the contribution of individual workers to increased worker productivity has continued to rise steadily over the past 30 years, with the workforce becoming more highly educated with each passing year. Not only has the workforce become more educated with each passing year, but the investment of individual workers in their own education has also increased steadily. Tuition and fees have increased far faster than the rate of inflation or of average wages over the past 30 years. Although financial assistance has also increased over this same time period, it has not increased at the same rate as costs, and so even with increasing financial assistance students are still paying more for their educations today than ever before. So while education is more evenly distributed today than any time in American history, income is more unevenly distributed than just about any time in American history. Not only are American workers more educated today than ever before, but American workers pay more for their own education today than ever before as well. Furthermore, the vast majority of productivity gains deriving from capital improvements, i.e. the development of better technologies and systems, are products of the work of ordinary workers. For example the average income for a computer programmer in the year 2000, the height of the technology frenzy, was just $57,590, yet much of the productivity gains from the 1980s on have been the product of broad systematic improvements made by millions of "average" computer programmers. The same can be said of all kinds of professions, from scientists to engineers to designers to technicians to educators, all of whom are making real improvements to capital, yet extremely few see any of the gains. There are also the productivity gains that are simply a product of more efficient work practices, which are products of education and training, and these gains cross all professions and position levels, from office clerks, carpenters, and fry cooks on up to managers and executives. One of the major trends in income inequality that began in the 1980s was dramatic increases in executive compensation. From the 1980s on, compensation for the average American worker has barely kept pace with inflation, yet compensation for executives running the same companies at which worker's pay has barely kept pace with inflation have seen their compensation levels increase by orders of magnitude. So what have been the real driving factors behind these enormous gains in compensation by top executives, while the vast majority of workers have seen no gains at all? Are these executive gains justified? Did executives all of the sudden start creating vastly more value in the 1980s and 90s? Did Reagan's deregulation, tax cuts for the rich, and other financial reforms all of the sudden remove the chains of oppression holding top managers down? As, William J. McDonough, chairman of the New York Federal Reserve Bank, said in 2002, "I find nothing in economic theory that justifies this development, I am old enough to have known both the CEOs of 20 years ago and those of today. I can assure you that we CEOs of today are not 10 times better than those of 20 years ago." There are multiple contributors to this situation, which include the massive increase in the off-shoring of American production, the decline of labor unions, and changes in compensation practices by corporations. As for the off-shoring, the income gains realized by executives from the off-shoring of American production were essentially one-time gains. These were effectively windfall profits made by the sale of American production to foreign countries, i.e. they got rich from selling America out. Notice that I'm not using the word jobs here, I'm using the word production, because we aren't just talking about jobs. Even if these executives laid-off the same number of workers and replaced them with robots and automated systems here in America that would still be better than off-shoring. Yes, given the current economic system it would still have led to growing income inequality, but by off-shoring American production to foreign countries these executives have not only eliminated certain jobs (arguably others are also created) but they have also reduced American control over production of the goods and services used by Americans, and not only have we lost some degree of control, but we have also lost capital and not only have we lost capital, but we have also lost the engine for further capital development. Growth in executive compensation due to off-shoring is essentially the product of the elimination of domestic workers and replicating them with foreign workers at a lower cost, with a portion of the difference being awarded to executives. With American unions in decline, the ability of workers to fight such moves or to bargain for better terms of release has been diminished. Even if one argues that off-shoring creates new economic opportunities in America, this still doesn't justify the compensation going to executives for the practice, because those executives aren't the ones creating the new jobs, their compensation bonuses come from the elimination of existing ones, not from the creation of new ones. But off-shoring and the decline of unions don't account for everything, there are other major factors. Over the past 30 years executive compensation has changed dramatically, not just in the amounts of the compensation, but also the forms of it. During the 1980s and 1990s executive salaries increased dramatically relative to average workers, but other forms of compensation increased even more, such as awards of stock, severance packages, cash bonuses, interest free loans, use of corporate property, and short-term incentive bonuses. Unlike compensation for other employees, executive compensation is often governed by a board of directors, and that board of directors is typically elected or appointed by share holders. But who are the shareholders? Well, since the end of World War II the portion of US stocks held by individual investors has been in decline, crossing the 50% mark in the 1980s. While the majority of stock was held by individuals from the end of World War II until the 1980s, today individuals directly hold only about 30% of US stock, the rest is held by institutional investors. So what does this have to do with anything? Institutional investors have different interests than individual investors and different perspectives. Over the past three decades boards of directors have become more homogenous as well, with more of the same people sitting on boards of different companies. Institutional investors are now the primary electors and appointers of boards of directors, and these investors are themselves wealthy. They are more likely to support high compensation packages for executives and less likely to take an interest in compensation for the average worker. But there is even more to it than just that as well. Executive compensation is also a form of protection against takeovers. In effect, executives are paid in part simply not to destroy the company, i.e. they are paid not to undermine the interests of the shareholders by engineering undervalued corporate takeovers and things of that nature. In addition, executives have significant control over share price by the manner in which they report information. So executives are paid highly in part in order to provide a disincentive to underreport information leading to lower stock prices, which makes takeovers easier and less costly. Now, in the 1980s and 1990s continuing deregulation of industries as well as other factors made the environment ripe for takeovers. As a result the institutional shareholders appointed executive compensation boards who worked in their interest to highly compensate executives as a means of defense against hostile and undervalued takeovers. As institutional shareholders became more powerful, it led to an arms race, in which the threat of takeovers grew and the defense against them grew as well. Giving executives extremely high pay and golden parachutes (extremely rich termination packages) was seen as form of insurance against hostile and undervalued takeovers. The decline of unions also paved the way in this regard as well, because union contracts also form as a protection against hostile takeovers, but as unions declined this opened the door for more takeovers, leading to the further pumping up of executive compensation. So in this sense, executive compensation has very little to do with reward for performance, it is simply a form of insurance, the price of which got ever higher with deregulation and deunionization. But again that still isn't the whole story, there was another aspect to this as well , which was the ever decreasing interest rate. With the Federal Reserve continuously lowering the interest rates this also contributed to the building of leverage needed to engage in corporate buyouts and consolidation. So what happened over the past three decades was a snowball effect, in which concentration of capital led to the further concentration of capital, and as an insurance against being undermined by the executives in charge of all of this capital, the institutional shareholders grossly overpaid them as a means of buying their loyalty. There were side effects of this executive compensation as well though, most of which the institutional investors were happy with. High executive compensation and short-term bonuses, which have grown tremendously over the past three decades, are engineered as a means to prevent executives from undermining the company by causing the share price to be undervalued, making the company ripe for a takeover. The converse is true as well, however, that this type of compensation leads to inflation of stock prices due to overly optimistic reporting, as we should have all learned by the events of the past 10 years since the initial dot.com bust of 2000 and the several busts and scandals that have emerged since. But the investors didn't mind inflated stock prices, especially since investment institutions typically work on a commission basis and thus get paid more the higher the prices go. In addition to all of this there was yet one more factor that I believe contributed to high executive compensation, and that was the rising incomes of "superstars" in general. The rise of superstars really began in the late 19th century with the rise of national newspapers and increasing literacy rates. Each technological advance that made it possible to copy and spread the performance of an individual to larger and larger audiences without any additional work on the part of the performer increased the power and wealth of superstars. Radio, movies and television have all of course played important roles in the growth of superstars, but in the 1980s and 1990s superstardom was taken to new levels. In the 80s and 90s the incomes of singers, musicians, and athletes skyrocketed due increasing exposure, increasing power of the media channels carrying their performances (caused by media company consolidation), increasing numbers of Americans consuming programmed media, expansions of the roll of superstars into a wider range of outlets, and importantly the growth of portable and home based forms of media consumption, such as audio and video tapes, then CDs and DVDs. And so a vast array of technological advances and corporate collusion led to ever higher paydays for the superstar products of the entertainment industry, all made possible by intellectual property right laws which entertainment companies have successfully lobbied to strengthen over the years. As compensation for superstar entertainers grew, it was only natural for the incomes of other types of so-called top performers to try to keep pace. The result is that by the 1990s three major types of super income receivers had a emerged: Corporate executives, entertainment superstars, and investors. Of professional investors, hedge fund managers have stood out over the past decade as receiving especially high incomes. (Hedge funds are effectively unregulated private investment funds). As was the case in 2005, the income of celebrity superstars generally even outpaced that of corporate executives, but the income of hedge fund managers grossly overshadowed even that of celebrities, with the top hedge fund manager in 2005 receiving an income of 1.5 billion dollars for the year. Even that income was greatly eclipsed in 2007, however, when the top hedge fund manager had an income of 3.7 billion dollars and five hedge fund managers had incomes of over a billions dollars each for the year. Essentially all of this income was taxed at the lower capital gains tax rate of 15% as well by the way. What each of these types of income receivers (corporate executives, celebrities, and investors) has in common is that their incomes are products of collective systems. Celebrities are a bit different than executives and investors, though in actuality the incomes of the top celebrities such as Steven Spielberg and Oprah Winfrey are heavily reliant on control of capital as well. The incomes of celebrities, aside from their investments, are almost entirely a product of the technological ability to multiply an individual's work so that a single unit of labor is amplified into millions or now even billions of units of labor, with no extra effort on the part of the "laborer". While technology provides the means to do this, it is ultimately intellectual property right laws that allows celebrities (or anyone else using such labor amplification technologies) to become wealthy from their efforts. Celebrities benefit from the fact that via technology they can put in one day's work, say eight hours of work in a recording studio or movie set, and have that work recorded and effectively turned into billions of hours of work, and that there is a legal system in place which effectively turns that recorded work into a form of capital, to which they (or their producers/managers, etc.) retain rights. Under this set of circumstances what happens is that enormous levels of compensation are awarded to marginally "better" (in theory) performers. In other words, those that come in first place get hundreds or thousands of times greater rewards than those that come in second place, even though second place may only be fractionally "less good" than first place. Thought about in terms of a race, its like a situation where a first place runner runs a mile in 4 minutes and is awarded $10,000 and a second place runner runs the mile in 4 minutes and 5 seconds and is awarded $1,000, third place takes in $500, and the fourth place runner who ran the mile in 4 minutes and 45 seconds gets nothing. The first place runner receives 10 times more compensation than the second place runner, but the first place runner isn't really 10 times better than the second place runner. Likewise, the fourth place runner is only a little slower than the first place runner, but gets no compensation at all. This is similar to how celebrity incomes work, where the entertainment market is dominated by a relatively small number of performers who are really only marginally "better" than other performers (better in this sense being judged by their ability to garner incomes) yet they receive massive rewards for their marginally better contributions due to the fact that performance amplification (i.e. recording and transmitting technologies) creates a marketplace in which a small number of performers supply the demands of exponentially larger numbers of consumers. So celebrities are a little different than other types of high income receivers, but their incomes are still rooted in control of capital and their incomes are also still products of redistribution from social systems, in which their single units of labor are transformed into many units of labor by technology which can only be supported by the actual labor of thousands, millions, or billions of other workers. If not for the wealth created by other workers, celebrities would have nothing, as the products of their own individual labor by itself is meager. Executives are the most obvious beneficiaries of collective systems, however, as they sit directly at the tops of collective pyramids. A corporation is a collection of individuals working together to create value. Executives typically create little or no value themselves directly. The incomes of executives have to come from the collective pool of wealth created by the workers in the corporation who produce tangible assets. All of the income of executives is effectively a product of redistribution from the producers of tangible assets to the executives. Value that is paid to executives is value that was created by other workers in the corporation, but was not paid to them, and was instead redistributed to the executives, and as such, each dollar paid to executives represents in real dollars a loss of income to the workers who produced it. This isn't to say that executives are worthless and deserve no income, they do perform services that, in theory, when done correctly, benefit the other workers at the corporation, and thus of course they deserve some compensation. Executive compensation has risen so dramatically over the past three decades not because executives started producing more value, however, but because control of capital has become more important and more powerful, and as the heads of corporations executives are the ones who control the capital. Their incomes are a product of capital control, not of their contribution to value creation. In other words, their incomes are a product of position, not production. As for investors and investment managers, all of their income effectively comes from capital gains. All capital gains are a product of work done by other people. Without employees working there would be no capital gains. Large investors are the ultimate beneficiaries of collective systems and socially created value. Celebrities benefit from the technological ability to turn their form of work into a type of capital that allows a relatively small amount of work to be exponentially expanded into a means of receiving value from millions of people, but at base their own work is the root of their wealth. Executives benefit from the value collectively created by workers at the corporations that they sit atop. But large investors benefit from value created by millions or billions of workers around the word. All forms of investment income, i.e. rents, interest, dividends, and gains from the sale of capital, are only made possible by value created through work. If people don't work then value is not created and rents don't go up, capital is useless, and there is no value from which to pay dividends, etc. In this sense investment income: rents, interest, dividends, etc., are all forms of taxes on labor. The income of the investor is not generated by the investor, the income of the investor is generated by other people, and then transferred to the investor via the legal system. If other people don't work then the investor won't have an income. This is the difference between value created by an individual vs. value transferred to an individual. For example if a farmer has a family farm that produces 100 eggs, 10 gallons of milk, 20 lbs of meat, and 50 lbs of vegetable a day, then that family is producing that amount of value each day regardless of anything else. That is clearly value created by them and no one else. If everyone else in the world decided to stop working and the economy totally crashed and no one bought anything from anyone else, that family would still be producing that value and would still benefit from it. This isn't the case with investment income however. With investment income, none of the value is produced by the investor, and all of the income is dependent upon collective value creation and social systems. If an investor invests $1,000 in a business on a condition of a 10% annual dividend (on a condition to get paid $100 a year), and then the workers decide to all just quit, then no value will be created, the company will fail and the investor will lose his investment and will get no income from it. Investors provide a service by effectively sharing capital, but incomes from investments are dependent upon other people using that capital in ways that generate new value, some portion of which is then taken from the creator of the new value and given to the investor as compensation for the service provided by investing. There is nothing fundamentally wrong with capital gains/investment income, a.k.a. unearned income, the issue however comes in its distribution, and recognizing that investment income is not representative of value that is created by the recipient, rather it represents value that was created by other people. Obviously, however, people, especially those with high incomes, receive income from multiple sources. Celebrities don't just have income from their own performances, executives don't just have income from the compensation they get from their position. The fact is that almost all of the income for the wealthiest Americans comes from investment income. The vast majority of the income of the wealthiest individuals comes from investment income, because this is the only way that such high incomes can be generated. Again, high incomes are generated through investments not due to the contributions of the individual investor, but because investment income is a product of collective wealth generation, whereby value created by millions of people is transferred to single individuals. 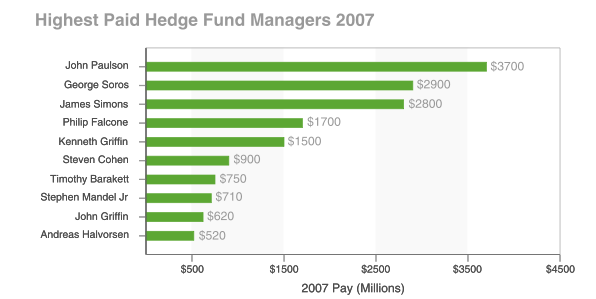 Consider the $3.7 billion income of John Paulson the hedge-fund manager in 2007. In order to argue that John Paulson actually "earned" that income, one would have to argue that John Paulson himself created $3.7 billion worth of value for the economy, for which he was compensated. If this were true, it would mean that John Paulson created as much value as 73,656 average working Americans with incomes of $50,233 in 2007. This would be to say that John Paulson created more value than most moderate sized American cities in 2007. Is that reasonable? Of course not, because John Paulson didn't cerate $3.7 billion worth of value, he extracted $3.7 billion worth of value without having created it and without even having created anything close to it. But what about entrepreneurs, like Bill Gates, Michael Dell, Sam Walton, etc. these people really have made major contributions and created real value over the past 30 years. Yes, this is true, but again the level of their compensation still far exceeds the level of their individual contributions. None of these people personally created billions of dollar worth of value. They all played important roles in the development of systems that were used by other people to create billions of dollars worth of value, but they themselves did not create that value, yet they as individuals received billions of dollars worth of compensation. It's not to say that entrepreneurs like this shouldn't be highly compensated, but it is to understand that the levels of compensation received by entrepreneurs in the 1980s and 1990s were not a product of their own making, it was a product of their ownership of rights to value created by other people in corporations that they founded. For example Michael Dell began building computers in his own dorm room in college, where he got his start in the industry. Those computers were computers that he personally created and income from selling them represents value directly created by him. He went on to ultimately become the CEO of his own company, Dell Inc., which sold high quality low cost computers that were manufactured in Malaysia and China. Michael Dell's wealth comes from the sale of millions of computer systems and components, none of which were made by him. His wealth was made possible by the fact that he was able to have computers built in Malaysia and China by underpaid workers. Without those Malaysian and Chinese workers building the cheap computers there would have been no Michael Dell, he would never have become super wealthy. Again its not to say that Michael Dell didn't deserve high compensation for his contributions to developing a supply system for affordable American computers, but the level of his compensation from Dell Inc. was unquestionably a product of the value created by thousands of other workers around the world. Without those workers building the computers Michael Dell could never have become wealthy. The level of his wealth was a function of the effective tax levied on the value created by those workers. His ability to levy that tax on the value creation of others is a function of capital ownership laws in both the stock directly owned by him and in his compensation as a CEO, determined by a board of directors, put in place by stock holders (including himself). The point is that everything comes back to capital ownership and control. The very high incomes in America and other capitalist countries are all products of capital ownership. Very high incomes are not the product of individuals working harder to produce more value than others, they are the product of ownership rights to capital which effectively draw income from the value produced by thousands or millions of workers in America and around the world. So all of the highest incomes in America (and generally around the world) are products of massive systems of collective production, in which significant portions of collectively produced value is funneled to a relatively small number of people. Millions, and ultimately billions, of people creating value, significant percentages of which are funneled to a few thousand people is what makes the wealth of the world's richest people possible. When we look at a breakdown of income type by income group, its clear that the wealthiest Americans receive a significantly higher portion of their income from capital than the vast majority of other Americans. As a side note, "transfer income" refers to income from government programs, such as Social Security, unemployment insurance, income assistant, etc. While transfer income obviously makes up a larger portion of income for low income groups, in fact the total amount of transfer income received by all income groups is about the same, with the top 1% actually receiving among the highest amount of transfer income per person. When we look at the distribution of income vs. tax receipts by type, however, we see that despite the fact that capital income is by far the primary form of income for the wealthiest Americans, the tax burden falls disproportionately on income from labor. 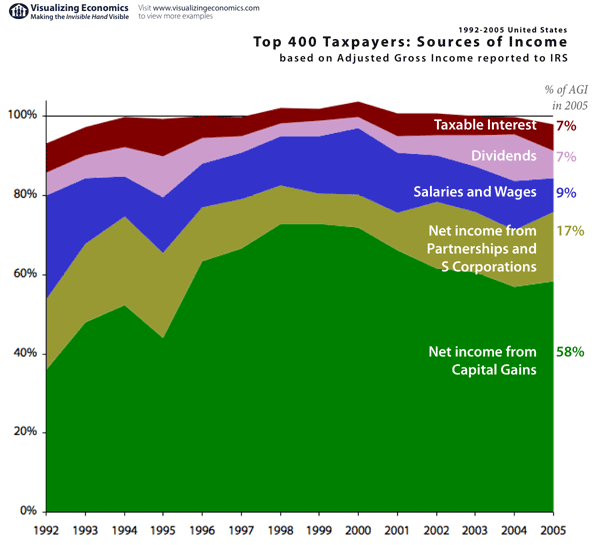 As of 2004 the form of income that is most heavily concentrated among the wealthy was taxed the least, while the form of income that was dominant among working class Americans is taxed the most. This has actually been the case ever since the so-called Reagan Revolution. The extent to which capital income was taxed in relation to income from labor fluctuated in America throughout the 20th century, but for most of the 20th century it was agreed that it was "unfair" to tax "unearned" income, i.e. income from capital, at rates significantly lower than earned income, or income from labor. The tax burden on capital was significantly reduced during Reagan's presidency and has been reduced further since his presidency in following with the trends established during the Reagan Revolution. There are multiple reasons for this. Yes, more people own some stock today than ever before, but the amount of stock (including mutual funds) owned by most American stock holders is very small, less than $10,000, while the wealthiest Americans own billions of dollars worth of stocks each. In addition, the majority of stocks owned by Americans in the bottom 80% of the income population are owned inside of retirement plans like 401(k)s and IRAs. What many Americans don't realize is that income from these retirement plans is taxed as though it were wage income, it is not taxed at the lower capital gains tax rates. The idea that around half of Americans "own stocks" is used to support the low capital gains tax rates, when in fact the only people paying those rates are individuals who generate income from investment outside of retirement plans, which is almost exclusively wealthy Americans. So while about half of Americans own stocks, the majority of those Americans are taxed at the higher wage rates on their investment income because most American's investment income comes only from their retirement plans. Likewise, with the growth of individual retirement accounts since the 1980s, it means that more of the capital that individuals do own is locked up in retirement accounts, and is thus not a source of income for most Americans until after age 65. The only people with meaningful investment income prior to retirement are wealthy Americans. As can be seen in the graph below, despite a significant increase in the number of people owning at least some stock during the 1990s, there was really no impact on the distribution of stock wealth. Yes, more people bought into the stock market in the 1990s, but the share of stock wealth owned by the wealthiest Americans nevertheless stayed the same or increased over this period. Furthermore, the so-called democratization of stock ownership has not lead to democratization of capital control, because despite the fact that more Americans own stocks today than ever before, the vast majority of that stock ownership is through mutual funds which are controlled by institutional investors, who in the end gain greater control and influence via the use of other people's money. More Americans today own some kind of investment, but far fewer stocks are owned directly by individuals, and average individuals who do directly own stocks own such small amount that their voting rights are meaningless, so while more Americans have investments in the stock markets today than in the past, Americans as a whole have actually lost ownership influence among publicly traded corporations. And the situation is even worse when it comes to private corporations and small businesses. The percentage of Americans owning a meaningful business today is lower than ever before. Yes, the number of small businesses has gone up significantly in America over the past two decades, but this growth in business entities is misleading. There are two primary drivers of this growth, what I call "micro-businesses" and also a growth in the creation of separate business entities for legal and tax purposes, which are actually owned by parent corporations. What I call micro-businesses are side businesses that people establish for minor part time work, but these businesses are not primary means of income, and they often report no income at all for years, with many people running micro-businesses with yearly incomes of less than $5,000 a year. These are side businesses for things like computer consulting, selling self-published books, selling arts and crafts, etc. There is typically little or no meaningful capital associated with these businesses. The reality is that more people work for large corporations today than ever before, and during the past 30 years there has been a significant decline in real small business ownership. By a "real" small business I mean a business that actually supplies an individual or family with their primary income. Small businesses like individually owned restaurants, hardware stores, pharmacies, grocery stores, clothing stores, mechanic shops, fabrication facilities, furniture manufacturing shops, repair shops, etc., have all diminished significantly over the past 30 years as capital concentration has lead to the dominance of large corporations in these and other fields. So, even with growth in the percentage of Americans owning stock, one has to consider that the percentage of Americans owning their own privately controlled capital has gone down. In other words, while the percentage of Americans owning small fractions of public corporations has gone up, the percentage of Americans owning their own meaningful capital has gone down significantly. As a society, Americans have less control over capital today than ever before. Average Americans own and control less of their own capital today than ever, and what capital is owned by average Americans is largely owned through financial institutions who practice the actual control over the capital. It is widely acknowledged by economists and political scientists that the economic policies of the United States over the past 30 years have been highly influenced by the economic agenda of the Reagan administration, both by Reagan himself and by the multitude of politicians and scholars and appointees that came to power during his presidency. Throughout Reagan's life and political career he railed against government programs, economic regulations, and taxation. This began with his political speeches in the 1950s and continued throughout his career. Yet when Reagan became president in 1980 he talked about "restoring America", but restoring America to what? Restoring America to how it was prior to World War II? That isn't what he meant and it isn't what conservatives meant when they talked about restoring America. Reagan had railed against the policies of the 1940s and 1950s back in the 1950s, and he continued to do so in the 1960s, yet the "Golden Age" of the American economy was the 1940s-1960s, with the large middle-class that was built through the policies that Reagan railed against. In the 1980s Reagan talked about restoring America, yet his policies were designed to do the exact opposite economically, they were designed to undo the America that middle-class Americans had come to think of as the "good ole days" to which America would be restored. The America of the 1940s and 50s was an America of a strong central government, with a highly regulated economy, built through the extensive use of federal programs and massive federal subsidization of the white middle-class. And that is what it was really all about. "Restoring America" always meant "restoring white dominance", yet it could never really be admitted that the white dominance of the 1940s-1960s was itself a product of government programs. What happened in the 1960s and 1970s was that discriminatory practices by the federal government and state governments were challenged and the benefits of government programs began increasingly going to blacks and minorities in the way that they had only gone to whites previously. When this happened a new narrative emerged among conservatives, a narrative that was echoed by Reagan, and which became a fundamental national belief when Reagan came to power in 1980. This false narrative was that the white-middle class had established itself all on its own, not with the help of the federal government, but indeed despite the obstacles put in its way by the federal government. You see, once minorities began receiving many of the same benefits from the government what whites had enjoyed for decades, one could not simply say that blacks shouldn't be able to get the same benefits as whites, and one couldn't acknowledge that whites had gotten where they were with the help of those same benefits. For those that opposed minority access to government benefits the convenient narrative was that whites had never needed such benefits in the first place and therefore no one should have them now. This was a core aspect of how the American federal government became the enemy of post-World War II conservative America. The government was seen as good by the vast majority of whites in the 1940s and 1950s, when the government was almost exclusively helping middle-class whites. When government policies began adopting measures of fairness so as to give the same benefits to minorities that it gave to whites, then the white middle-class was easily turned against such policies. But this merely opened the door for the adoption of broader "free-market" policies and ideology. Many of the so-called "free-market" policies of the Reagan era weren't readily supported by the white middle-class, but the fear stirred up by conservatives that government involvement in any shape or form might lead the incomes of whites being taxed away and given to undeserving minorities, or that government programs would in one way or another help blacks at the expense of whites, was enough to push many middle-class whites to support economic agendas that they otherwise would not have. While Reagan and conservatives railed against government debt and federal spending, the policies of Reagan and the Republican party as a whole brought about unprecedented levels of deficit spending that had not been seen since World War II. Reagan came in to office lamenting what he called an unsustainable national debt, yet by the time he left office the debt had almost doubled as a percentage of GDP (and had far more than doubled in raw dollar terms). 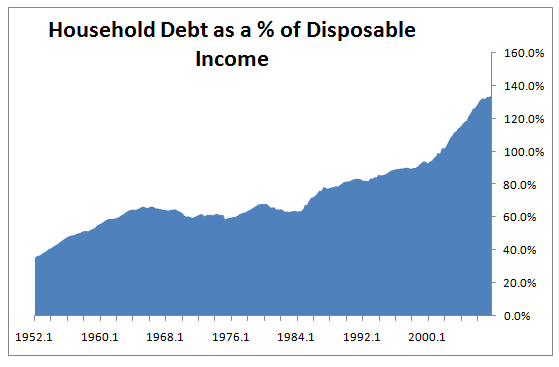 Not only had the debt of the federal government been pushed to its highest point in decades by Reagan's policies, but personal debt grew significantly as well. Conservative defense of growing income inequality was simple, the basic claim was that voiced by Milton Friedman, which was that the standard of living was improving and that was all that was important. In the particular problem of inequality, what is true, what is unquestionably true, is that there's been a widening difference in wages earned. You have had the skilled wages go up relative to the unskilled wages. However, there has been no comparable widening in the levels of consumption. If instead of looking at income, you look at levels of consumption, if anything that's become more equal. The fraction of families that have a dishwasher, that have a sewing machine, that have a television set. In respect to consumption, it's very hard to avoid the view that people have been getting more equal rather than more unequal. The fact that an economist like Friedman could acknowledge that there was a disparity between consumption levels and income levels and not acknowledge the obvious implications in terms of debt is astounding, and yet it was also quite typical. Free-market economists since the time of Reagan flat out failed to address the fact that economic stability and the ability of the middle-class to support the economy is inherently tied to income inequality. That as income inequality increases the stability of the economy decreases and the ability of the middle-class to support the economy decreases. Friedman always failed to acknowledge the fact that the growth seen in the American economy from the 1980s through the end of the century was propped up by unsustainable levels of personal debt, deficit spending, an ever increasing number of workers per household, and one time gains from the exporting of American production to foreign countries. And this is the issue that the majority of people continue to fail to understand today. The American economy of the past 30 years has always been unsustainable. Conservatives today talk about the "economic miracle" that occurred under Reagan, but the fact is that economic growth was modest under Reagan, and what economic growth did take place was largely a product of borrowing. The economy of the past 30 years has been built fundamentally on debt and other unsustainable trends, such as lack of investment in infrastructure and constant reductions of interest rates to fuel the debt dependent economy. But at a certain point, when interest rates get too low, borrowing itself begins to greatly distort the economy, as we saw in spectacular fashion with the housing bubble of the 2003-2007. The ability to borrow cheaply leads economic actors into making decisions that they would not otherwise make. And this played a significant role in the ballooning of executive compensation as well, as the ability to borrow cheaply, combined with deregulation, brought about an environment of excessive corporate takeovers and mergers, leading to the rise of "defensive" compensation practices for corporate executives, who were given compensation packages completely out of line with their contributions in part as a defense against hostile takeovers. 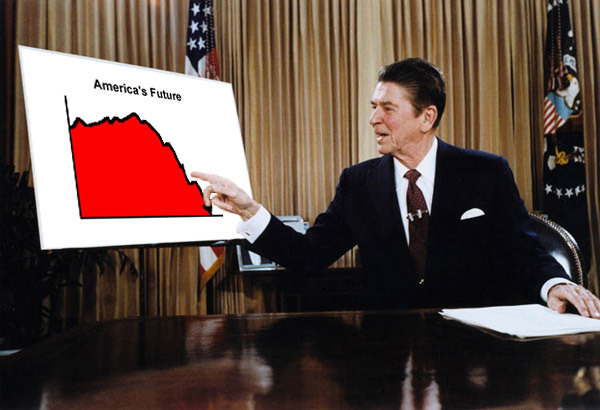 And while the trend toward concentration of capital ownership and control was already underway prior to Reagan, the economic policies of Reaganomics opened the flood gates instead of strengthening the dam, leading to an even more dramatic rise in capital concentration over the past 30 years than would have otherwise been the case. The concentration of capital ownership by institutional investors added further fuel to the income disparity fire, with institutional investors acting in ways that individual middle-class investors previously had not. This helped pave the way for the massive off-shoring of American industry in the 1990s, during the time of cheap fuel, cheap borrowing, and institutional investors who were cozy and comfortable with executives but not workers, who pushed executives to take actions that would lead to greater market volatility and short-term gains, both of which were beneficial to "investment" institutions, while they are not particularly healthy for long-term economic stability and growth. The result was that many people got rich quick during the 1980s and 1990s, while their very actions were leading to the overall demise of the American economy. Indeed the system of incentives that emerged from the Reaganomic agenda is one that has driven the country into a downward economic spiral as those driving the economy into the ground benefit from its destruction. One of the biggest economic ironies of the past 30 years has been the belief among conservatives, famously voiced by Reagan, that "government is the problem", and the claim that government spending inhibits economic growth, when in fact two of the technologies that contributed the most to real economic growth in America over the past 30 years were developed by the government: the internet and satellite technologies. The internet is the type of technology that is very unlikely for the private sector to ever develop, because when the internet was being developed there was no immediate commercial intention for it. Furthermore, it's something that took decades to develop and we know that during this time there was no similar private network being developed, and if some company had developed similar technology they would have made it proprietary and intentionally not open in the way that the internet is today. It is the openness of the internet that has made its economic impact so huge. One of the other major technologies upon which real economic growth was produced over the past 30 years is satellite technology, primarily satellite communications. Telecommunications as we know it today would not exist without the major pioneering of satellite communications technologies by the federal government and the N.A.S.A. space program in general. Today everything from G.P.S. to telecommunications to weather forecasting to the entertainment industry owes a debt to decades of government research and funding for the development of the technologies that make modern information transmission possible. The internet and satellites are quite arguably the most important technologies of the past 30 years, upon which huge segments of our modern economy are based, and these are both technologies that were fundamentally developed by the American federal government, with the next closest rival being the government of the Soviet Union, not free enterprise. It was only after these technologies were developed to a working and proven level by government programs they were then adopted, exploited and expanded upon by private industry. While many economists and pundits talk about how long it will take to recover from the current recession and for the American economy to return to its "normal operation" of the past 30 years, they fail to recognize that the economy hasn't been operating "normally" for the past 30 years in the first place. The reality is that the demise of the America economy began some 30 years ago. The seeming decent functioning of the economy these past 30 years has been an illusion propped up by public and private debt, and basically by riding on the solid base that was built in this country during the 1940s-1960s. The solid economic base that was built during that time, both in terms of the middle-class itself and in terms of infrastructure and institutions was so strong and so well built that it was able to carry the country for several decades even as it was being weakened. The policies of the Reaganomic agenda reduced investment in the nation's infrastructure, reduced investment in education, reduced investment in long-term research and development, and instead squandered resources on grossly over-funded military spending and on privatization schemes that resulted not in the shrinking of the size of government nor in the improvement of government services, but rather in the development of a private sector with a profit motive to continuously get its hands on more and more tax payer money. Turning the government into a contract broker that funnels taxpayer money to private for-profit companies is not a way to reduce government spending, indeed it inevitably insured increased government spending, as the privatization schemes of the past 30 years have proven. There is a reason that government spending never went down with the private outsourcing of government work, because by getting private companies so heavily involved in the running of the government it inevitably did not lead to more efficient and effective government, it led to a government controlled by the private sector, which the private sector has become able to use as a tool to increase profits. The private sector works well when it is truly fully private, and the public sector works best when it is truly fully public. It's when you give the private sector large scale access to public funds that corruption and complications inevitably take place, yielding results far worse than what either the private or public sectors would produce independently. The fact of the matter is that the policies of Ronald Reagan and his ideological supporters in office have directly led to the ballooning of public and private debt in America, to increased income inequality, deterioration of the nation's infrastructure, and the weakening of the American middle-class. The economy of Reagan was always an illusion. The real economic growth that has taken place since 1980, and there definitely was some real economic growth, owed much of its success to the solid economic and technological base that had been built in this country in large part by the federal programs of the 1940s-1960s. Not only has the economy of these past 30 years been largely propped up by debt and by a lack of engaging in the spending necessary to truly sustain and grow the country and the economy long-term, but the undoing of many of the tools for the promotion of economic fairness that had been in place from the 1940s through the 1970s also means that a minority of the population has benefited immensely at the expense of the working class. Not only has a small minority of super-wealthy Americans benefited disproportionately from the value produced by the American economy as a whole, but this disparity in income and wealth growth has itself undermined the economy and exacerbated American economic instability. The incomes of the wealthiest Americans these past 30 years has been flat-out unearned and undeserved. It is the largest case of redistribution of wealth in this nation's history with the exception of the original redistribution of land from the Native Americans and the wealth gained through the use of slavery. It is a redistribution of wealth from the middle-class and working poor to the super-rich. Value created by working Americans, and indeed by workers around the world, has been taxed away from the working class, not by the government, but by capital owners. This redistribution of wealth is at the heart of the economic problems in America today, it is the root cause of the housing crisis, it is the root cause of the rise in household debt over the past few decades, it is the root cause of funding problems for Social Security and Medicare, and it is most definitely the root cause of the corruption of the American political system. As the middle-class becomes relatively less wealthy the middle-class loses political power. Income and wealth inequality always coincide with political corruption and power inequality. Not only have the wealthy, empowered by the Reagan Revolution, stolen value produced by the working class over the past 30 years, but they have taken the political power away from the middle-class as well in the process, and this is Ronald Reagan's true legacy, and it remains to be seen if America can survive the harvest of what Reagan sowed.